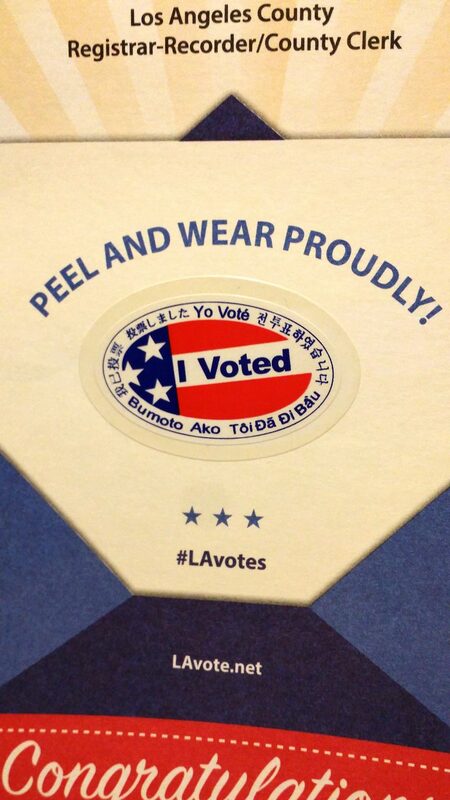 I got my absentee ballot today from the Los Angeles Country Registrar-Recorder/County Clerk. Voting in the US is quite different than in Norway. And a lot more fun. I just voted on condom use for adult film performers. In Norway, you vote for the party you most agree with by picking their list of names. During campaigning, they will often propose what they intend to do or how they intend to vote on existing issues, and if you agree with (most of) that, you vote for them. You can fiddle with the voting slip and cross out names to bump favorites up the list, and even write in a name from another party, but generally you are voting for an entire party, not individuals. And there is never a direct vote on law changes. Those are always decided by the elected politicians. Direct voting in Norway usually is about organization: Merging municipalities, or joining the EU. At least for California, there is voting on state and local laws, especially ones that affect taxes or spending. So I have been deciding on whether or not to legalize marijuana and hemp, remove the death penalty or make the adult movie industry healthier. Who knew voting could be so entertaining?